The cold early morning water was splashing up against the side of the boat, with my left hand tight against my thigh holding the rope which was attached to the canoe being dragged at the back with its guts filled with our decoys and kit bags. The waves were very rough and we were all taking turns keeping an eye on the “V” shaped waves which formed and were slowly tempting the canoe almost caressing it, and then every few waves large amounts of water would almost fill up the canoe, and then the bow would lift up again and the deck plates would collect the crystal like water drops. The river was filled with darkness and the water was freezing cold, it made you appreciate the comfort of the boat. It was still very dark out and we were moving right along the shore going North West up the river toward our duck hunting spots. The lights all around us were flickering orange, red and yellow surrounded by lush forest and swamps grass. I longed for the warmth of the fireplace and a nice hot drink but the excitement of the hunt was a much more powerful attraction indeed. It had been raining now for the last two hours and it was slowing turning into a light drizzle. After our thirty minute boat ride, we finally reached the launching spot and the pilot brought the motor almost to a stop in order to coast toward the shore with the underside of the boat slowing down with the help of the thick weeds and tree stumps below the water’s surface. The hunter at the front leaped out into the water and pulled us in using the rope to the font of the boat and then stabilized it by pushing down on the tip of the bow with his two hands. One at a time we hoped out of the boat and then got our shotguns out of their carrying cases, grabbed some shells and then got kitted up with our backpacks and decoy bags and prepared ourselves for the crossing over land to the embankment where our respective hunt spots had been marked. There was a serpent shaped trail of tall grass which had been padded down by other hunters to get to the embankment, so two of us pulled the canoe onto the shoreline and slid it along like snow sled on the moist grass. It was hard labor but instead of complaining about the pain in our shoulders and arms, we focused on the prize and thought of the early French fur traders who must have suffered tremendously during similar portages. An additional twenty minutes had passed and we were all in our shooting positions and now it was time to lay out your shells and prepare your kit for the hunt. I slowly unloaded my decoys from my duffle bag and launched them into the water and tall grass. Once they were in the position, I moved back into the high grass and created a natural blind and placed myself into a comfortable shooting position. I took a few breaths in order to relax and wait for dawn, when the sun just breaks the horizon. We did not have to wait too long and the teal starting flying in from all directions, they were incredibly fast ducks and some were flying in very low to the water, then circling around and then coming in for a landing. Just like last year’s hunt the birds flew in over top and you could hear the feathers cut through the thin morning air right above you. They were beautiful; I would compare them to fighter jets flying over head in perfect unison. Just one week before opening day, I watched a duck hunting video produced by Knight & Hale and my focus was to improve my “Call Back” and my “Feeding” calls based on their recommendations; and it worked like a charm, the ducks came in low, reacting to my calls and then as one of them came in low to touch down near my decoys I instinctively fired a Remington #3 steal shot into the air with a slight lead and harvested my first teal of the season. It was a brilliant hunt, they are fast birds indeed. Teal’s the Deal on opening day! 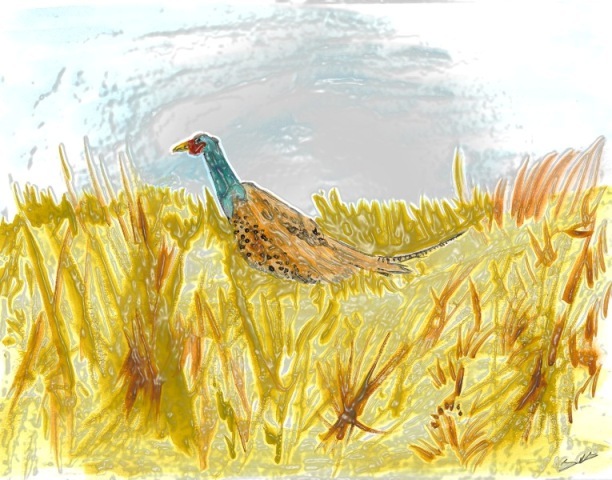 Even though hunting dogs are quite often used for hunting Pheasant, the upland birds can be hunted without; setting out early in the morning along dense bushes and fence lines found along the edge of farm fields. The birds may not immediately burst into flight; sometimes the birds will stay close to the ground and move quickly through the thick foliage. Keep a look out for the white feathered ring, blue and red-head and the metallic golden colors found on the belly and flanks. Experts shot gunners recommend using either a 28 gauge or 12 gauges with #7 ½ shot and generally shots are less than 60 yards in distance. Have a Great Hunt!